This is a very busy time of year for those of us involved in both orchestras! On 11th March we had our HCO strings concert in the new Emsworth Baptist Church, which was very well received. Players and audience appreciated the acoustics, which are clear and helpful but not overpoweringly resonant, and the smaller venue meant that the audience were closer to the performance and felt more surrounded by the sound. 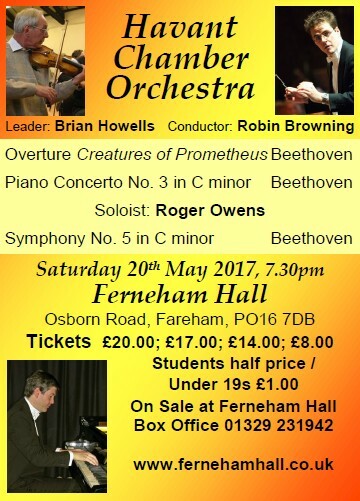 We have already had several requests to hold further similar concerts in the same venue, possibly involving the full Havant Chamber Orchestra. However, the limited seating capacity of the church (especially taking into account the space needed for players) means that even if we had a full house it would be nearly impossible to break even. Also, the lack of raked seating or raised staging made it difficult for many of the audience to see the players, which means that we feel we could not charge significantly more for tickets. We will consider various options and we may well decide we can afford to continue with at least a further string concert in the same venue. Several Havant Chamber Orchestra players are also involved in events for the new Havant Music Festival, especially in the Havant Baroque ensemble, led by Cathy Mathews, which is performing at St. James’ Church in Emsworth on 9th April. See the back page for more Havant Music Festival events. In the mean time, Havant Symphony Orchestra have a concert with an unusually wide selection of different items, varying from a tuba concerto to Schubert’s ‘Unfinished’ symphony. This is definitely a good time to bring along new audience members to enjoy the experience of live orchestral music! 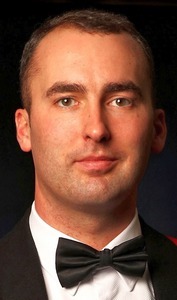 The pre-concert talk will be given by our bursary award conductor Tom Griffin. Hello all – I do hope you have got your tickets for the next HSO concert on the 25th March – because I think it is going to be a good one and programme I would certainly want to hear, if I wasn’t actually conducting it myself. Our concert begins with Mendelssohn’s fabulous overture Ruy Blas, based on the play by Victor Hugo and, incidentally, a play which Mendelssohn disliked at his initial reading. But he was asked to write a concert overture for the play and came up with the popular work we know today. There isn't space to go into the entire play’s plot here but basically Ruy Blas falls in love with the Queen and ‘complications’ ensue – of course! All will be revealed in the concert’s programme notes, I’m sure. Anyway – It’s set in Madrid, which adds to the colour and the drama of the piece. I always enjoy conducting Ruy Blas and have done in all sorts of different venues, including in St John’s Cathedral in Malta. To a packed audience I might add! The day after the concert I was in a local bank in Malta and someone came up to me and said how much they had enjoyed the concert. The price of fame eh? By a strange coincidence the second item on the Malta programme was In the Steppes of Central Asia, which is also our second item on the 25th March. They just seem to fit I guess! It’s typically Borodin with great melodies, which are embroidered with grace notes, particularly the main one, which features the cor anglais. The addition of the grace notes means that it’s almost impossible to hurry this charming tune. A famous compositional trick is to introduce a theme, then another and later on in the work put the two together. It’s an old trick but it works particularly well in this delightful miniature. It also has a rather catchy ‘walking bass’. The work’s first performance was conducted by Rimsky-Korsakov – Borodin’s friend and another member of that esteemed group of Russian composers known as ‘The Mighty Handful’. The concerto is one for tuba and before you start giggling – perhaps you’re not – it’s a real concerto and a terrific piece. 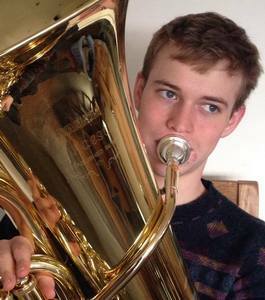 Tubas have got short changed, where concertos are concerned, but Gregson’s Concerto certainly makes up for lost time and uses the tuba to full effect. There’s no doubt that Gregson is a skilled composer and that he really knows his craft. The tunes are toe tapping and there’s even a cadenza! Pretty rare for a tuba. 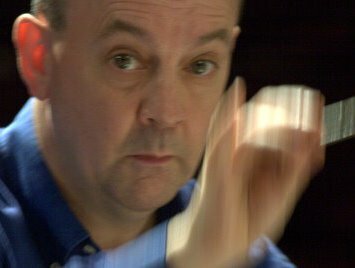 I haven’t conducted the piece in Malta, ’though I am sure the Maltese would love it, but I have performed it several times, most notably at Snape Maltings in Suffolk, with a splendid young lad from the Wells specialist music school as soloist. Sadly I have forgotten his name. He’s probably married with four children now? The concert finishes with, what I consider to be, not only one of Dvořák’s most brilliant works but also the best set of orchestral variations ever composed – well certainly to date. Dvořák’s invention and unique ideas are simply mind blowing. Sorry – not an expression I like but in this case it’s really most apt. His ideas just keep coming and the variations link so imperceptibly that the listener is just carried along with the wonderful flow of the piece. Dvořák’s modulations are also extraordinary and lead us to some interesting tonal areas and subtle textures. In places what he gives us is very simple but in others the complexity of his invention is thrilling. Listen out for the ‘love duet’ between the horn and the flute. Also the violin solo variation and the magnificent Finale with its speedy fugue. I hope you enjoy your evening with us and do please bring a crowd. JB. Franz Schubert is one of my favourite composers and to have the chance to conduct one of his most well-known works is an absolute delight. The two completed movements that comprise the Unfinished Symphony shows Schubert’s masterful position in history as a transitional composer between the Classical and Romantic periods. Both of the movements are written in sonata form but Schubert doesn’t follow the typical plan; for example the second movement is in sonatina form as it lacks a development section. Whilst Schubert was writing the work he was reportedly suffering with syphilis which he contracted after a lifetime of public house cavorting and the remedy of the time was to drink mercury, so he was simultaneously poisoning himself. His agony can be realised within the work as there is striking contrast between the sublime and the thickly-scored fretful sections, especially in the second movement. Schubert idolised the emotional intensity of Ludwig van Beethoven’s work and reciprocated similar ideas within his own compositions. This can be heard within the Unfinished Symphony which is part of the reason why it has stood the test of time, even in its incomplete form. I am very much looking forward to performing such a popular work in the orchestral repertoire and I know the musicians are too. (c/w Symphonies nos. 1 & 3 'Scottish'). It was flattering to read Mike Allen’s review of the Symphony Orchestra’s December concert and to be complimented on leading the horn section “with panache”. However, I feel that I must correct the implication in his piece that I have recently stepped up to first horn. In reality, I have played with the HSO and HCO for 31 years and filled the first seat in HSO for more than 25! And I hope to be there for a few more to come. It is possible that some confusion may have arisen with my new name in the programme. For those horn buffs among you, when I married Roy Holton last July, it wasn’t just for his surname! Tickets £8 (£2 under 18).